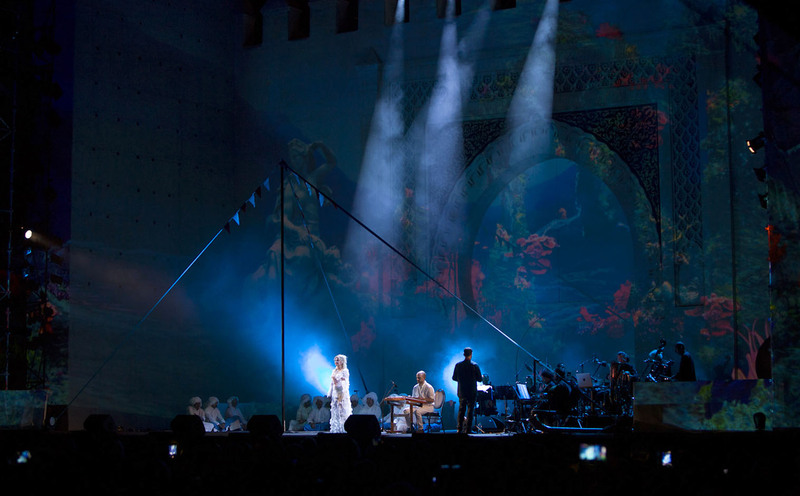 2017 – Fes Festival of World Sacred Music: musical direction, composition and arrangement for “Spirit on the Water”—the festival’s opening performance—which explored water from musical, spiritual and ecological perspectives. The epic saga that unfolded on the stage was an abstracted homage to water as a source of life, an inspiration for the sacred, and a magnificent ecological fable. It featured an extravaganza of images and music, a large orchestra, soloists from different traditions coming from over the world—including Kuwait, Egypt, Palestine, Greece, France, Belgium, Spain, Brazil, India, Iran, China and Mali—and an acquatic sonic exploration that incorporated myths from antiquity, whale songs, onomatopoeic renditions of water, and dreamlike underwater scenes. The creator of the show is Alain Weber, artistic director of the Fes Festival of World Sacred Music.